JKBOSE Class 10th Bi-annual Date sheet 2018 - 2019. 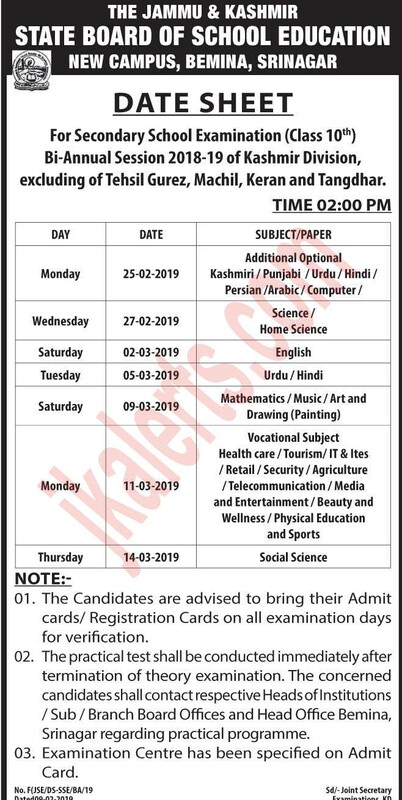 Jammu and Kashmir Board of School Education JKBOSE Class 10th Bi-annual Date sheet 2018 – 2019. For Secondary School Examination (Class 10th) Bi-Annual Session 2018-19 of Kashmir Division, excluding of Tehsil Gurez, Machil, Keran and Tangdhar.